Just because you live in the city doesn’t mean you need to resort to trudging to Urban Outfitters every Christmas to buy their faux-ironic replica Charlie Brown Christmas tree. So long as you have a car, there are plenty of amazing farms within driving distance of Chicago where you can pick (or cut!) your very own majestic, gigantic Christmas tree. Trekking out to these farms is worth the trip. Richardson Christmas Tree Farm is one of the more accessible entries on our list, and with a full 75 acres of land full of trees for you to mercilessly cut down and drape ornaments from, they’re definitely worth a look. They don’t skimp on amenities either, offering complimentary cocoa, as well as homemade donuts available for purchase. Moreover, each tree you buy from Richardson comes with a unique tag and an individually numbered receipt to remind you that your tree is one of a kind. If you’re in a rush this season, hop in your car and hit up Puckerville Farms. Sure, their website may look like it's from the Geocities era, but don’t let that fool you. This family farm has provided trees to members of the Chicago Bears and Blackhawks, and if that's not enough, trees from the farm won the Cook County Farm Bureau’s contest for best decorated farm tree in two back-to-back years. Ben’s Christmas Tree Farm says that the adorable farm animals on-site are for children to pet, but we’re sure they won’t mind if you get down on your hands and knees making kissy faces while telling a baby goat that he is a very good boy. 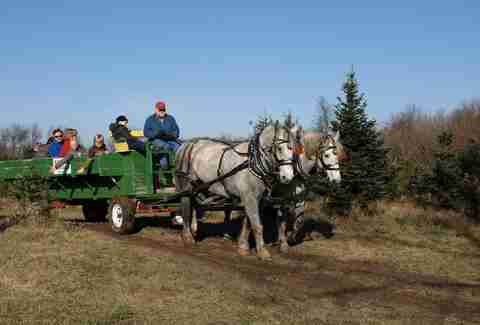 Besides the adorable animals, Ben’s also features an incredibly wide variety of trees (two pines, three spruces, and four firs), free horse-drawn wagon rides, and complimentary hot cocoa. This farm might be the most beautiful one on our list. Adjacent to a picturesque lake, Camelot Christmas Tree Farms features eight tree varieties (five firs, two pines, and a spruce), and they’ll even lend you a saw so that you can cut your own down. Just make sure to get there well before sundown as there’s no outdoor lighting on this farm. Plus, you’ll want to get there early anyway so that you can watch the sun set over the horizon. This farm started out as a way for the monks of Marimon Abbey to cultivate Christmas trees for the surrounding area in the 1930s, but since then (largely due to the fact that an aggressive tree disease forced the monks to hire the farm’s first non-monk employee back in the 2000s) Abbey Farms has grown into a legitimate agri-tourism destination. Abbey Farms offers six different varieties of trees to choose from, as well as a wonderful full-featured cafe, bakery, and shop where you can buy in-season produce from the farm. You might want to make this spot a year-round destination. OK, listen. We know it’s three hours from Chicago. We get it. But if you don’t mind taking a little weekend excursion to the Indianapolis area, Dull’s Tree Farm is more than worth your time -- plus, they have a cute little bed and breakfast there if you feel inclined to spend the night. After you take your pick of the farm’s fine pines and firs, make sure to stop by the corn maze and check out the indoor slides! It really seems like Dull’s might have a complex related to their name. We don't mind, though. 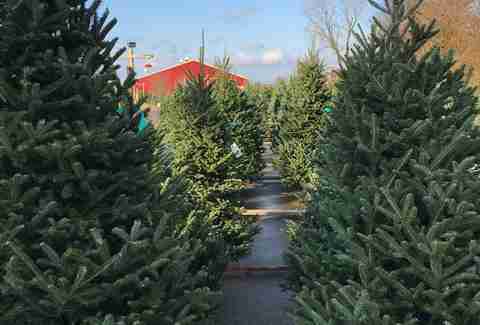 Since Hensler Nursery expects Chicagoans to make a two-hour-plus trip to Indiana in order to get a tree, it’d kind of be a real bummer if they didn’t go all out. Luckily, they do. In addition to their 300(!) 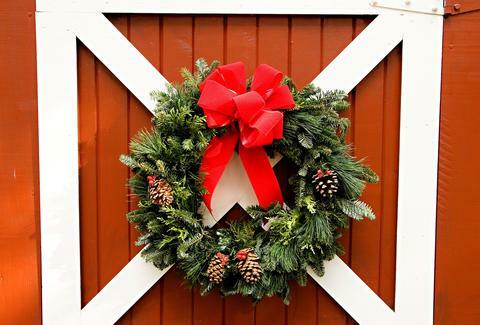 acres of farmland packed full with firs and pines, they also host a Christmas Fest -- Santa and Mrs. Claus visit the farm every weekend, and they even have a parade the day after Thanksgiving to celebrate the start of the season. Don’t worry -- there’s plenty for your kids to do at Hensler, so it should make up for all the are-we-there-yets you got while you were on your way. This one’s another hike, and it’s not as ginormous as Dull’s Tree Farm, but it has a charm all on its own -- partly due to the fact that its website's URL is TreeRex.com. 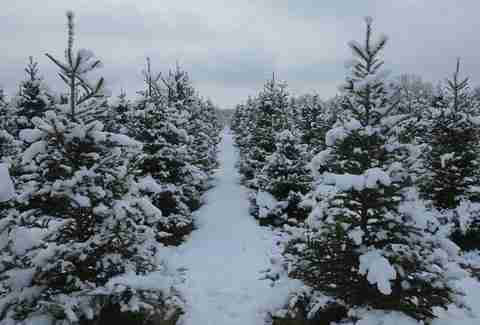 Apart from the amazing website name, Miller’s Christmas Trees offers an incredibly wide variety of trees, including harder-to-find varieties like Canaan fir and Serbian spruce. Once you’ve picked out your tree, enjoy Miller’s fresh roasted chestnuts and hot cider before taking a complimentary wagon ride and checking out the gift shop full of locally sourced, handmade gifts and stocking stuffers. 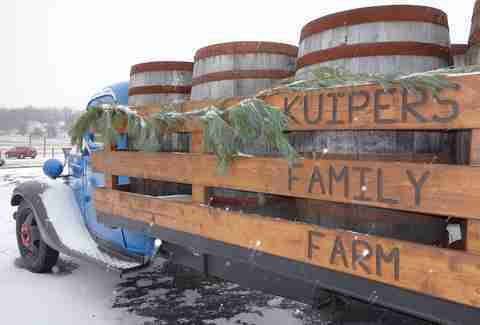 Kuiper’s Family Farm has a fine selection of firs and pines that will be perfect for your holiday celebration, but -- as far as we’re aware -- they’re also the only tree farm in the area to offer free, homemade apple cider donuts. You can get some with every single tree purchase. 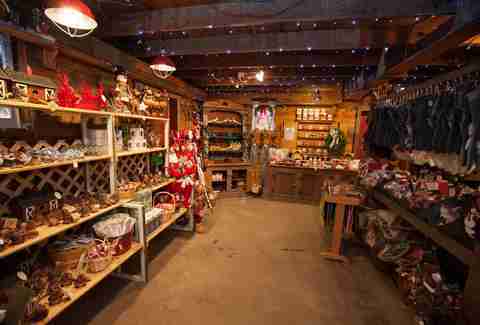 The gift shop is also a must-see: The shop sells cider, pie, and other baked goods made from the apples grown on the farm in addition to a smorgasbord of holiday ornaments, knick-knacks, and necessities.